Student nurses were to the fore on Saturday as UNISON members joined the 150,000 people marching in London against cuts and austerity. 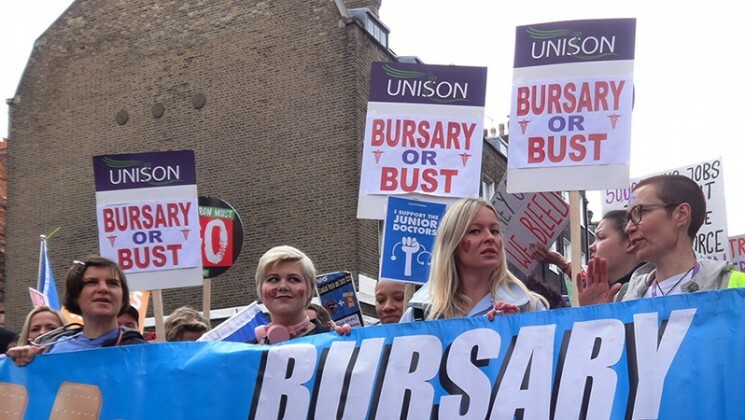 The March for Health, Homes, Jobs and Education was organised by the People’s Assembly Against Austerity, and saw the student nurses take their fight against government plans to axe the NHS bursary back to the capital’s streets. Assistant general secretary Roger McKenzie was at the head of the march and later addressed the rally on behalf of UNISON. 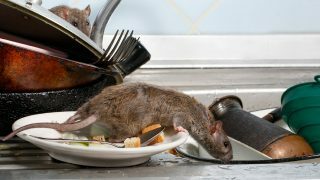 “The reality of life for too many public service workers is that to survive, they have got do not one or even two jobs but often three jobs, just to put bread on the table or to keep a roof over their heads,” he told the crowd. Describing the UK government as one that “demonises public service workers, scapegoats immigrants, demeans disabled people, ignores the please of refugees and destroys our NHS,” Mr McKenzie noted that “we can’t just wish these things away. “We have to go out, door to door, community to community and workplace to workplace to stand up for progressive politics that puts people first rather than big business. 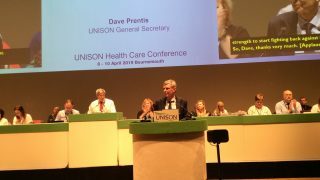 UNISON head of nursing Gail Adams described herself as being “immensely proud of the students who participated,” adding that they were “continuing to hold the government to account for making the wrong decision on the future of student funding”. And he said that the march and rally was vital to “call for a real alternative and to show that another – better – Britain is possible”. UNISON is the largest trade union representing student nurses. We are dedicated to campaigning for a better deal for nursing and midwifery students and run several campaigns around areas such as the bursary and accommodation.